Hair Tinsel Is Taking the Fashion World by Storm! 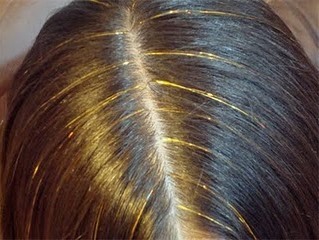 The glittery strands are showing up everywhere from the red carpets of Hollywood to the runways of New York. The thin colorful strands (also called hair shimmers or hair bling) are made from silk and are applied by tying them around the root of several hairs. When tied correctly, hair tinsel can last for weeks and can be washed, blow-dried, and heat styled (up to 400 degrees). Hair tinsel is a great way to stand out on your next night out, show school spirit, or celebrate the holidays. It's also perfect for children because it adds color and sparkle without being toxic or permanent. This glamorous look is so easy and affordable, anyone can do it! First, select a single strand of hair tinsel and fold it in half forming a loop. Next, select 2-3 strands of hair at your desired location (more if you have thin hair). Tie a slip knot around the selected hairs by wrapping the loop around the hairs and pulling the ends of the hair tinsel through the loop. Slide the knot to the scalp. Tie a square knot with the selected hairs and the hair tinsel (L over R, then R over L). Make sure the knot is touching the scalp. If the knot still slides, tie another square knot. That's it! Enjoy your new head turning look and soak up all the compliments! Style your hair as normal but be careful if using a comb not to pull directly on the knot. If you want to remove your hair tinsel, grasp the knot with your fingernails and slide it out of your hair.